Wine is generally bottled in glass bottles – to this date the most satisfactory method of storage and one far preferable to alternative methods, such as storage in a carton or ‘wine box’. 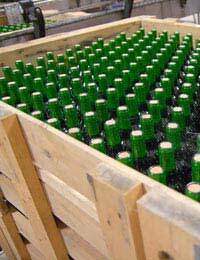 Bottles are made generally to best suit the type of wine being stored. In France, Spain and Germany bottles vary regionally, both as a means of keeping specific wines at their best, and as a means of distinguishing wines between regions. Arguably, a bottle will make little difference to the overall taste of a wine, although a sparkling wine, for example may pour differently from a bottle other than that associated with Champagne. Secondary bottle fermentation also dictates the attributes of the sparkling wine bottle and cork, which is similar throughout the world. Wine bottles generally have cork stoppers, ideal for keeping wine airtight. In some cases cork taints the flavour of wine through contact with the wine. This is called ‘corking’ as is different from the addition of small pieces of cork found in wine after a bottle is poorly opened, though both cases are undesirable and can be avoided through the use of screw tops or new ‘plastic’ corks. Some bottles feature a ‘punt’, which is a concave dip in the bottom of the bottle. This punt takes up space and gives a bottle an appearance of being bigger – hence many French 750ml (standard size) bottles appear to be bigger than equivalent measure bottles from different regions. This feature has no definitive purpose, although it does make a bottle more stable and, arguably, easier to hold when pouring. It is also essential to sparkling wine bottles where it helps to ease the pressure build up associated with carbonated liquids. Wine bottles come in various sizes. Most common are the standard 750ml and the half bottles (375 ml). Most wine comes in the former size. Dessert wines such as Muscatel and Sauternes often come in half sizes as do, increasingly, a variety of Champagnes and Ports – due to their high cost, and the fact that they must be consumed once opened. Other bottle sizes include the magnum (1.5L), the Marie-Jeanne (2.25L), the Double Magnum (3L), the Jeroboam (4.5L) and the Imperiale (6.0L). The Salmanazar, Balthazar and Nebuchadnezzar are 9,12 and 15 Litres respectively. These largest formats are popular with Bordeaux wine collectors: the small air to wine ratio helping the wine to age favourably. Bottles vary in colour across regions between green and amber, with clear bottles increasingly being used in the storage of white wines, which following advances in viticulture rarely contain sediment which may discolour a wine. Clear glass is also used for dessert wines. The Bordeaux style bottle is certainly the most common, with a tall symmetrical body and short neck, it has been emulated in Italy and across the New World. The Burgundy wine bottle shape is the other classic design, emulated across the world, especially where Burgundy style wines are emulated. The neck starts just above half way up the bottle and forms a near triangle up to the top of the bottle. The German Mosel, Alsace and Rhone bottles are much narrower than French bottles – essentially like an elongated Burgundy bottle. Sherry, port and Madeira tend to come in highly decorated and very sturdy bottles. The neck has a bulge – both decorative and practical in nature, it helps to catch the sediment. There are a variety of other wine bottle types, some with no connection to region. Perre Aneslme Chateau Neuf du Pape, for example, comes in a bottle that is twisted and off centre, as if it has been melted! Variations in bottle shapes are a good talking point for the enthusiast, especially when an unusual one is found – of course it helps if it carries a good wine!